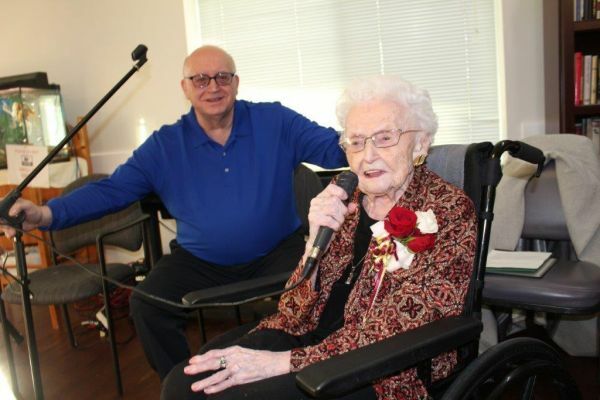 Helen Stachow celebrated her 100th birthday recently with family and friends at Points West Living Heritage House in Vegreville. There were greetings from around the world, lots of love and stories, and, of course, cake! Helen Stachow was born in Vegreville on Ukrainian New Year’s Day, January 14, 1918. One-hundred years later, minus a day, she and many of her progeny celebrated her centenary. She was joined by five of her six children; Frank, Debbie, Marlene, Joyce, and Michelle (Lillian, who lives in California was unable to attend). Helen has 19 grandchildren, 24 great-grandchildren, and nine great-great-grandchildren. When you add in spouses, Helen’s extended family has 91 members. In addition to raising her six children, Helen worked outside the home for several years; four years at St. Joseph's Hospital, and 3½ at the Vegreville Nursing Home. She also worked at a group home and did a lot of volunteer work for the community. Helen’s husband Frank passed away in 2011. At the birthday celebration, Helen’s son Frank read certificates and letters of congratulations from government officials and dignitaries. He also read cards and personal messages from family and friends around the world. Many of her grandchildren and great-grandchildren spoke about their ‘Baba’ and shared their memories of the traditions, special moments and food. To them, every day spent at Baba’s home was special, especially at Christmas, and her spaghetti was ‘to die for’. When Helen took her turn at the microphone, she thanked everyone for coming and celebrating with her. Photo: Helen Stachow celebrates her 100th birthday with friends, family, and cake at PWL Heritage House in Vegreville. Here, she is welcoming guests as her son Frank looks on.